Keeping your home at a comfortable temperature can require energy use 24 hours a day, 7 days a week. Smart thermostats connect to your central heating and cooling system in ways traditional thermostats aren’t able. Plus, some also have adaptive technology, also known as advanced learning, which allows a device to remember your behavior and adjust the temperature accordingly in the future. The result is a thermostat that helps you cut energy costs through fine control over heating and cooling, without inconvenience or sacrificing any comfort in your home. There’s a long list of things that a smart thermostat can do better than a traditional system. They connect to all your other smart devices. They control your home’s climate wirelessly. They allow you to program different temperatures for different days of the week. They learn your behavior and make adjustments automatically. And finally, most smart thermostats come compatible with mobile and/or web applications, giving you insight into your energy usage and home climate in real time and on the go. You can turn your system on or off completely wirelessly, for better savings, comfort, and peace of mind. What smart thermostat features are important to consider? Smart thermostats include some added functionality, but they’re not all created equal. Read below for some important features to understand and consider as you shop. If you want remote control of your thermostat system, a smart thermostat that can connect to your home Wi-Fi and transmit data is your best bet. This feature allows you to control the temperature of your home and understand your energy use in real-time, all from your smartphone, tablet, or computer. Some thermostats come with a full touchscreen and a large, colorful display, while others are less bold, with similar functionality. Touchscreens can make using your smart thermostat simple, while some thermostats come with unique physical features to make climate control intuitive and easy. If you’re asking Alexa to play music for you, why not ask her to change the temperature too? Depending on the smart home software you use your smart thermostat may be able to access features such as voice control and alerts that are built into your smart home setup. Two of the top thermostats on our list, the Nest Learning Thermostat and the ecobee4, have different compatibilities with smart home software. Nest’s product can communicate directly with Google Assistant through a Google Home speaker, while the ecobee4 can link with Siri and Apple Homekit. Both thermostats work with Amazon Alexa, as does the Schneider Wiser Air thermostat. Uber knows when you’re likely to be heading “home” and Pandora can pick out the perfect song just for you. Computers these days are able to adjust to your habits - smart thermostats work the same way. After you request temperatures for specific times of the day a few times, smart thermostats with advanced learning will understand your habits and can make the adjustment for you. Never worry about turning your heating/cooling system on or off again. Geofencing technology can do it for you. A smart thermostat with geofencing technology sets up virtual perimeters around your home. When the technology is enabled, the device will know whether you (or, more accurately, your phone) are in inside or outside the perimeter. This allows the smart thermostat to know when you’re coming home or when you’ve left. Your home will be appropriately cool when you arrive and won’t waste energy after you’ve left. If you prefer to keep it simple, you’re in luck. Not all smart thermostats have the more sophisticated advanced learning and geofencing capabilities. Another convenient feature is the ability to set schedules by the days of the week. If you’re gone at the same time Monday-Friday you won’t need to turn off the thermostat each time you leave your home. With a seven-day schedule feature, you can program the thermostat to turn off while you’re at work and never worry about it again. The best feature of the Nest Learning Thermostat is in the name – it learns from your habits and changes climate settings automatically to maximize your energy efficiency. After you manually set temperatures for a few days, the thermostat will create accurate and custom temperature scheduling to save energy while keeping your home at the temperature you want. If you ever need to adjust your home’s temperature on the fly, Nest’s mobile app allows for remote and instant adjustments. The Learning Thermostat also supports direct integration with Google Home, so you can control your thermostat using your voice and the power of Google Assistant with a Google Home speaker. A newly included and popular feature of the latest (3rd generation) Learning Thermostat is the use of geofencing technology to track registered family members by their smart phone locations in order to understand when nobody is home and when energy can be saved. Daily energy usage data and tips on how to use less power are easily viewable from Nest’s mobile app as well. And if you are interested in even finer control of individual rooms, Nest now offers separate Temperature Sensors that link to your thermostat. Similar to ecobee's product, they can be placed in any room to keep it at the perfect temperature. The ecobee4 smart thermostat is ecobee’s newest thermostat model, following the success of their ecobee3. It supports geofencing, mobile app control, and classic programmable schedules, allowing you to set temperatures for different hours of the day. It can even communicate directly with Siri/Apple HomeKit for easy smart home integration. What sets the ecobee4’s capabilities apart, however, are its use of room sensors. A common issue with smart thermostats is they only measure temperature in the room where they are installed. As a result, the climate of the entire house is determined by a single room. Ecobee solves this problem with its room sensors, which can be placed in different rooms to change individual climate settings as necessary. The biggest upgrade from previous ecobee models is the new Alexa integration. Now, the ecobee4 acts as a physical Alexa speaker itself. It can do anything Alexa can do, like tell you the outside weather, play a song, or turn on and off connected lightbulbs around the house. The Sensi Touch Thermostat from Emerson has fewer software features, but still offers many of the essential smart thermostat tools. While the Sensi Touch doesn’t learn from your habits, it still can use geofencing to automatically adjust your temperature settings. If geofencing isn’t your thing, 7-day scheduling is a classic option, with the ability to access and tweak your climate control settings remotely through the Sensi app, or on the colorful touch screen on the thermostat itself. Like most smart thermostats, the Sensi Touch can be hooked up to most whole house systems, and can be controlled by voice software (after connecting it to voice-controlled devices like smart speakers). 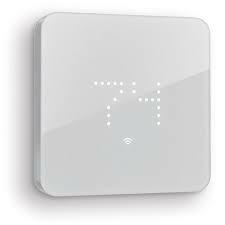 Schneider Electric offers a complete smart thermostat in their Wiser Air model. Switching on the “Eco IQ” mode allows the thermostat to begin learning your home habits and preferences, so that after about a week, your home is always the right temperature. What sets the Wiser Air apart from other learning thermostats is the method of learning - instead of having you set temperatures you want, simply indicate on the thermostat or mobile app if you are warm or cold, and the thermostat will adjust accordingly to make you comfortable. The Wiser Air also monitors outside temperature, and will adjust indoor temperatures based on the local weather conditions. The touch screen can display weather reports, including emergency weather alerts. Another novel and useful feature of the Wiser Air is the “Comfort Boost.” This option lets you pump a quick burst of heating or cooling through your home without changing your programmed settings or Wiser Air’s learned routine. Unique options like the Comfort Boost and Eco IQ mode set Wiser Air apart as a new take on climate control. Pair the Wiser Air with an Alexa-compatible speaker to control your home climate with your voice using the Wiser Air’s Alexa integration features. The Lyric T5 is similar to the Emerson Sensi Touch thermostat in that it doesn’t have some of the learning features of higher end smart thermostats, but the options it offers work well and provide high performance and value considering the price tag. One of the most touted features of the Lyric T5 is its geofencing capabilities: it is accurate and supports Home and Away modes for climate control. A Home mode means it detects your presence in the home, while an Away mode means the thermostat can't find you in the house, and will take energy-saving measures. The Honeywell mobile app or the thermostat’s touchscreen can be used to set 7-day schedules, which can be adjusted immediately from anywhere with an internet connection via the mobile app. The Lyric T5 offers quality at a low price point, albeit through a limited selection of features – currently, it only has Apple HomeKit and Amazon Alexa compatibility if you want to link it to your whole house smart setup. The ZEN Thermostat is all about simplicity. Design-wise, this thermostat is about as no-frills as they come, with a single color interface and low-profile lighting patterns that display the temperature. Even installation is simple, with the option for a wire installation or to power your thermostat by battery. The simplicity of the ZEN Thermostat continues into its software capabilities. Unlike products like the Nest Learning Thermostat, ZEN doesn’t have any fancy algorithms or predictive software. Instead, simple touch controls on the straightforward display are the mode of temperature adjustment. Like most smart thermostats, you can also access ZEN from anywhere using the mobile app to adjust temperatures on the go. The ZEN Thermostat also has scheduling capabilities, but only if you connect the thermostat to a smart home hub or speaker. The ZEN Thermostat is a straightforward device with basic smart thermostat capabilities, and is a solid option for a homeowner looking to save energy and live in a more intelligent home.